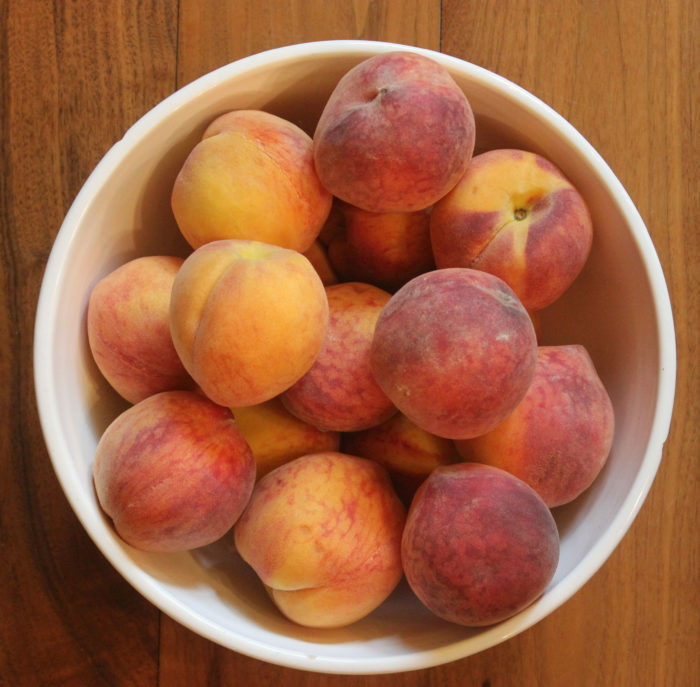 It is peach season and from your farmers market you can bring home fresh, ripe, aromatic peaches by the bushel. But what to do with them? They can be this pretty one minute and then deteriorate on you the next. Once mushy, the only place for a peach is your blender. You need a quick hit for those ripe, fit peaches you don’t want to waste. This solution is classic and delicious. Suzi and I always double or triple the amount of sauce here, preferring to let our peaches swim a little before consuming them. If you use the search box here on the blog, you’ll find many other peach ideas! Preheat the oven to 350°-375°. Melt half the butter in a large frying pan and cook the bread pieces over low heat, adding more butter as necessary and tossing or stirring and turning until they are lightly golden and the surfaces are crisp. Empty into a buttered gratin dish. Scatter over the raisins and peach slices, tucking them in here and there and arranging with the pieces of bread to form a fairly regular surface. Whisk together the sugar and eggs and whisk in the milk and cream. Pour evenly over the contents of the gratin dish. Bake for about 40 minutes or until the custard is set. Serve tepid, accompanied by the Sabayon sauce. The sauce is very rich in effect; this recipe may seem like very little, but it will adequately serve 4 — or it may be doubled. Remember that the sauce will double in volume so choose your saucepan accordingly. Prepare the bain marie first, placing a trivet in the bottom of a larger saucepan and pouring in enough water to immerse by one-third to one-half the smaller saucepan as it rests on the trivet. In a small saucepan, whisk together the egg yolks and sugar until lightened in color. Add the wine and immerse in the bain-marie, in hot but not boiling water, over low heat. Whisk until the sauce is thickened and its volume doubled. Lower the heat if the water threatens to boil, removing the saucepan momentarily while continuing to whisk — or raise the heat if the process is taking too long. Remove from the heat and continue whisking until the saucepan has had time to lose the heat absorbed from the hot water.